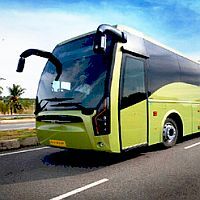 We are one of the top-notch tour and travel companies based in Indore (Madhya Pradesh, India). We are actively indulged in providing commendable bus ticketing services all over Indore to all of you out there. We have a strong foothold in catering to the requirements, preferences and demands of our clients through our qualitative services strictly abiding the budget that they have. All you have to do is just drop a line to us telling about your choice and the date and place you are planning to visit, we will book the ticket of the preferred bus within a short span of time. Rely on us our services wont disappoint you!